The tragedy, as a result of which has suffered not one generation; the tragedy, which has taken away lifes many thousand people; tragedy, after which for one day the young city Prypiat – became “city – phantom” on nearest 600 years … The fact-finding tour in Chernobyl begins from Kiev, about 09:00 to you will come the automobile. After a short moving (from Kyiv up to Chernobyl 140 km), you get in 30 km Zone of Alienation. The first stop is CCP (Control Check Point) “Dytiatky” – here check the documents and transport, the employees CCP verify the list of the participants of tour with groups structure. Children up to 18 years, entrance to a Zone of Alienation is strictly prohibited! 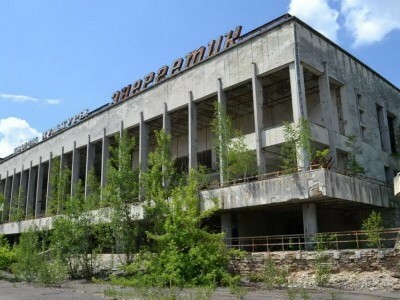 Together with the representative of the government agency “Chernobyl Interinform” the excursion continues, and you approach a place of basic events April 1986. In the office of agency You will obtain detailed information about the explosion on the 4th block of atomic electro station, you will see the map diagram of the lethal area and photograph of participants in overcoming the consequences of catastrophe. Along the route in 10 kilometer zone, will be stop near the monument “To people, which saved peace” – this is monument for the firemans, which first rushed forward to fight with the fire. 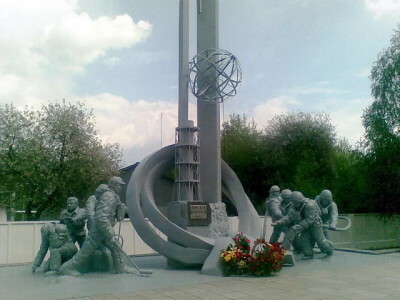 Memorial built not for the money of State, but “chernobyltsy” directly, first of all – firemens. 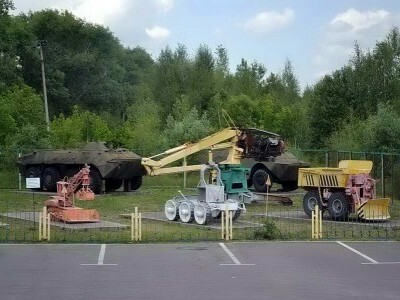 Near the memorial are located several machines, which participated in the liquidation, but close to them approach forbid – the intensity of radioactivity of very large. This all which remained from the machines cemetery. All the remaining machines cut and buried into the earth for decreasing the radioactive background. Hillocks along the road with the signs “the radiation hazard” eloquently show the places of transport burials. On horizon the outline of CHAES becomes visible. Station yet far, but already kingly overpeers in the distance. And he is a 4th rector, urgent now an object «Shelter». Photos-feet in a direct closeness from a reactor. At the station quiet and only pair workers can meet you during a visit. On an additional request, guide-accompanying will bring a group to the cool pond in which enormous sheat-fishes are led without effort zaglatyvayuschie the long loaf of bread beforehand provided tourists. 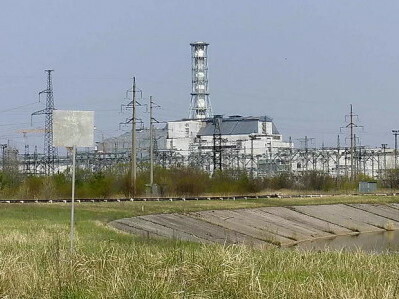 Feeding of sheat-fishes is not included in a basic round to Chernobyl’ and brought in in the program on a preliminary query. Further you will follow by tailings of the so-called «Red forest» are ten of thousands of hectares the forests which the first was assume a powerful radiocontammant after an explosion on CHAES. The lost forest was a considerable danger, for example at a fire, as a source of the repeated radiocontammant. Also this forest considerably worsened a radiation background near a road which was one of basic transport highways to the station. In 1987, round the forest a billow was poured in a 2,5 meter high and by general length an about 3,5 km. Trees knocked down for a burial place, swept and mortgaged in trenches, from above zasypali the layer of earth an about 1 meter. Now the Red forest practically all srublen and by hills with burial places you will follow in worn out the barbed wire city-ghost. 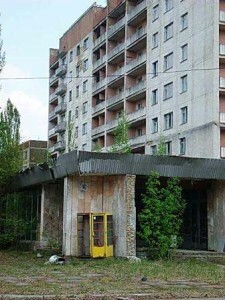 And it is Pripyat’!.. Here the «spirit of soviet time lives» until now – the roofs of buildings are crowned the coats of arms of Ukrainian SSR, on houses inscription is yet visible the «World Labour of May», and yellow call-boxes cost on streets. The park of attractions, which it was planned to open on May, 1, 1986, accepted not a single visitor so.